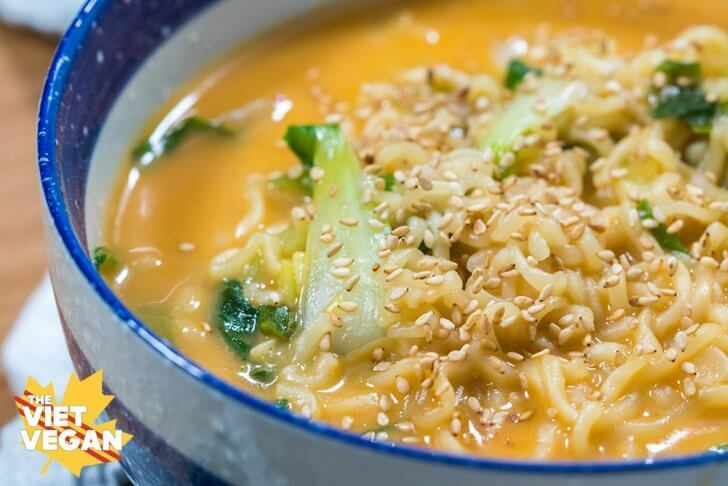 This vegan cheese curry ramen is inspired by those cheese curry ramen cup noodles I’ve seen but never been able to try. Intrigued by the spicy, cheesy, flavour I’ve seen in videos, I really wanted to try it out for myself, especially when I had some leftover coconut milk from another recipe. Lately it’s been the ramen I make when I really want noodles but am trying to be more conscious of how much sodium I’m eating. This soup isn’t super light on sodium, but I feel a lot better about it than the packet of MSG and salt; which don’t get me wrong, tastes delicious, but making a bowl of this rich, umami broth tastes way better. I’ve always struggled a little with body image; it’s taken a while for me to be happy with myself and find the balance between being kind to myself as well as being aware of how I feel. I’ve never made any claims to be a “healthy” vegan, I mean, I’m healthy by most accounts. Blood work, overall fitness (although that could use some work), mental health is better some days than others… but I enjoy dessert when I want it, eat candy when I feel like it (I’m sorry wallet, for the dentist appointments). But I’ve never tried to advocate for a healthy lifestyle, just healthier…ish? I’m at a point now where I can’t move my body in the ways I used to, and not because I’m getting old. Mostly because there’s stuff in way where there wasn’t before. More “me” when I twist, more of my body when I bend. It’s not a bad thing, and it’s not unhealthy, but I just wanted to be able to fit in my clothes a certain way and feel more energetic. Plus, for years my family has been making remarks every now and then on how I need to exercise, or how I should eat fewer carbs, but unfortunately with my personality, when people tell me I need to do something I kind of go and do the opposite. It’s not a trait I’m proud of, and it’s definitely something I actively try to not do. But I am who I am, I suppose. So finally in my own time and my own volition, in an effort to have less “me” in the way of moving my body, I signed up for the gym. And got a trainer (just for a month or two). I didn’t realize how excited I’d be about it. I always knew I had an athletic build and that my body build muscle really quickly, but I have been finding it really satisfying to work out or do yoga and feel results and rewards from moving more almost immediately. Since most of the work I do nowadays is generally at the whim of social media algorithms and subjective results, having concrete results has been really good for me. And maybe I’m just seeing things, but even after a week I’ve noticed a change in my body. I feel stronger, stand up straighter, move a little faster. And I’m sure I’d see more results even faster if I ate a little bit healthier, but frankly I just kind of want to eat the same way I was eating before but not feel sluggish when I notice a little extra “me” after a few too many donuts. Because frankly, if I were to eat “clean” and be hyper conscious of what I am eating, I know I would find myself on that slippery slope of being really strict on what I ate and bordering a mindset I’ve been fighting really hard to resist for a while. So here’s to moving our bodies, whichever way we can. Here’s to eating what we want, and enjoying what we eat. Here’s to loving ourselves, be it to accept how we are, or to better ourselves mentally or physically and be kind to our bodies. Being healthy is a complicated and nuanced state of being: healthy for me is not healthy for everyone, and we all need to find where that balance is for ourselves. If you want to watch the video I did with Eddie’s voiceover to celebrate 30k on YouTube, please watch it below! It’s a fun time, and maybe it’s just me but I find Eddie’s voice pretty comforting so enjoy! 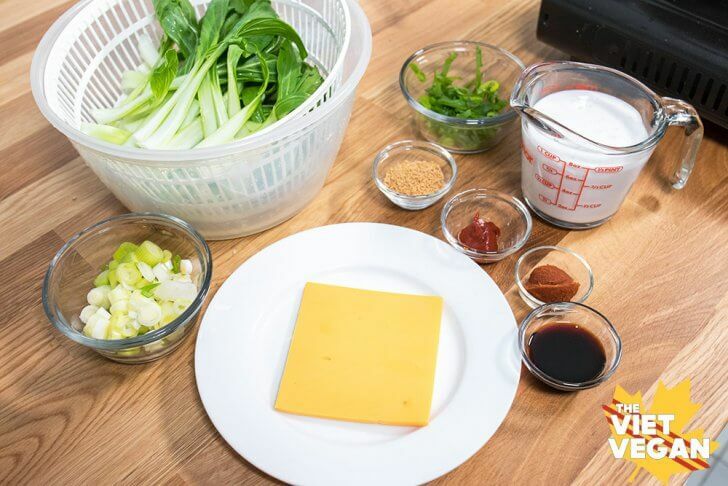 In a medium pot over medium heat, cook whites of green onions in oil until translucent. Add red curry paste and gochujang, and fry for a minute or two. 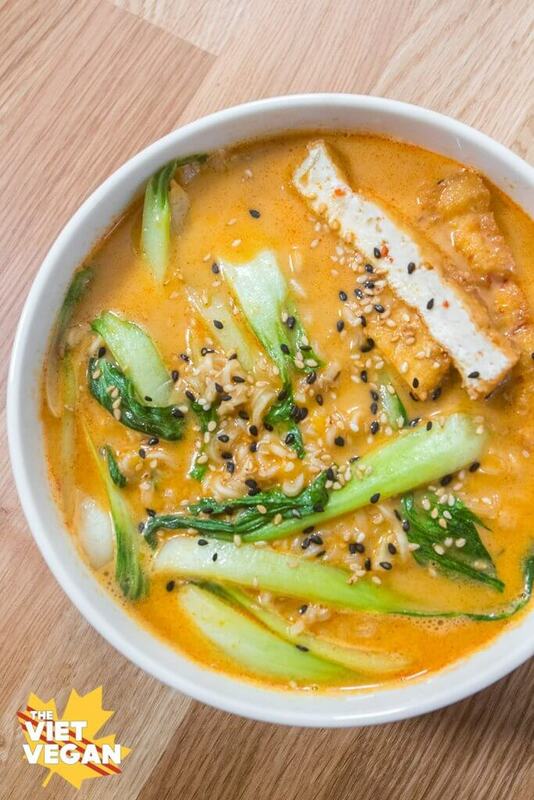 Add the coconut milk and stir to dissolve the curry paste and gochujang into the liquid. Add the water, mushroom broth powder, and tamari and stir to combine. Bring to a simmer. Once simmering, add the noodle cakes and cook for about 2-3 minutes until softened. Then stir in the sliced bok choy and cook until the whites are tender-crisp. If you're using edamame or fried tofu, feel free to add it in here. Finally add the vegan cheese slices on top and stir in to melt. Once the cheese is totally melted it'll incorporate into the broth to a cheesy brothy sauce. Garnish with greens of green onion and toasted sesame seeds and enjoy! 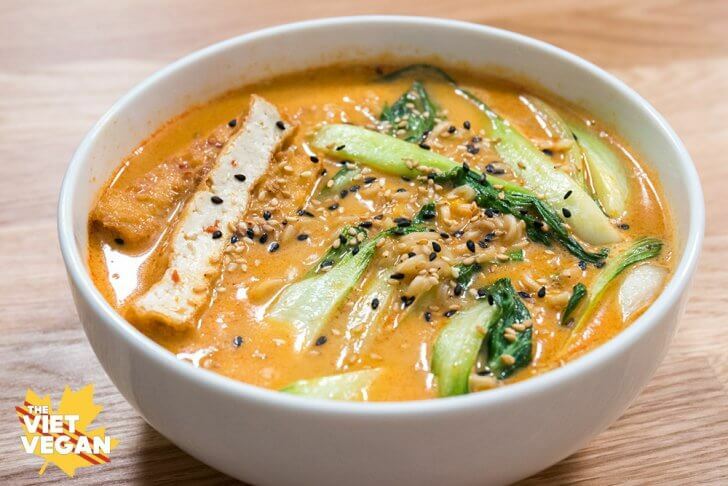 We actually have never had a Curry Ramen before, but this looks so so good. I'm gonna give it a shot soon. Thanks for sharing. This sounds like such a yummy ramen dish, and cuz I love ramen I'll definitely give it a try. I'll change some ingredients slightly to suit my taste. Thank you Lisa for sharing this recipe! The sauce here looks amazing! Actually everything does! This is my first time to your blog and commenting and I was wondering if I would be able to add you to my blogroll and visit and comment often!? Please drop by and let me know when you can! Thanks! This looks AMAZING!!!! I need this in my life RIGHT AWAY!!! Holy hell.....this is literally the first time I’ve commented on any of the cooking blog recipes I follow. And be made some good recipes from a bunch of different blogs!! But......this is literally one of my new favorite recipes OF ALL TIME!My husband and I can’t get enough.....only “edits” I made was we did use some fried tofu, and didn’t use the cheese. Freaking fantastic!! !